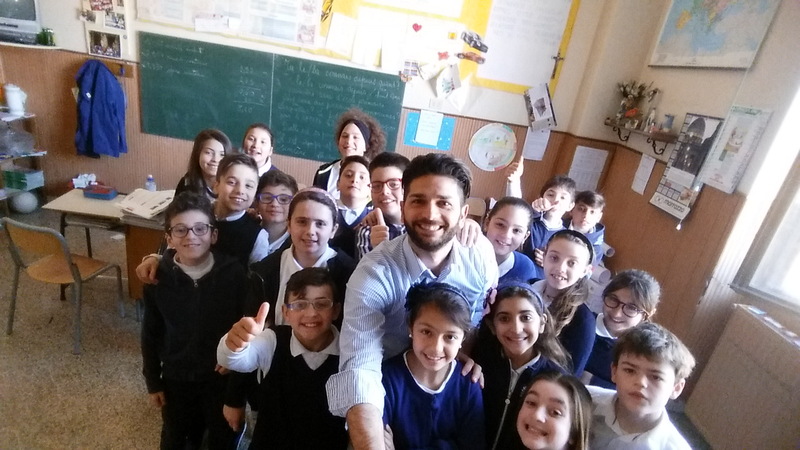 In a previous blog post, I introduced the experiment my brother and I conducted between November 2016 and May 2017 applying Scrum in a primary school in Italy. I talked about how the whole idea started, how we selected the school project and how we kicked off the experiment. In this post you will find the whole experience report, the results of the experiment and some conclusion we feel we could draw. The stand-up routine triggered very quickly some interesting behaviors right from Sprint 1. ● What did I do since our last stand-up meeting that helped my team meet the Sprint Goal? ● What will I do today to help my team meet the Sprint Goal? ● Do I see any impediment that prevents me or my team from meeting the Sprint Goal? In the same days they got one hour to actually execute the tasks they had pulled into work. The self-organizing daily planning was pretty rapidly received and understood by the kids, even though it was a completely new practice for them. It even affected school entrance punctuality in a very positive way: all kids tended to arrive on time to attend the stand-up and not to lose the opportunity to speak up. As described in the previous post, each backlog item consisted in representing one of the 20 Italian regions on construction paper, visualizing morphological characteristics, hydrography and main cities; the team which pulled the story had to study everything concerning the specific learning object, including economic activities, relevant historical figures, monuments, customs and traditions, without this information was presented or explained in any way. Each Sprint was three weeks long and ended with a Sprint Review where each team had to show what they learned and created during the Sprint to the teacher and the rest of the class. The shape they created on the construction paper was also integrated on the big map to get a truly potentially shippable product at the end of each Sprint, which all teams contributed to. Many even deepened the subjects presented in the school book with additional researches and volunteer studies. The demo was organized directly by the students in an autonomous and simple fashion, by splitting tasks inside each team. 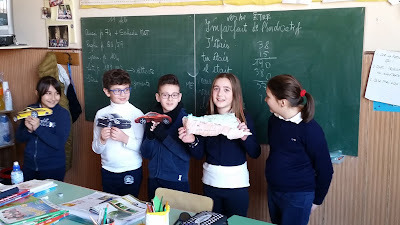 Each kid had his/her specific role in the product presentation, even though everyone was able to discuss any aspect concerning the region under review: this was yet another proof point for us that the ability to self-organize is kind of natural and desirable even for the youngest. After the joint Sprint Review, each team had their own Sprint Retrospective to encourage a collective self-reflection both on the quality of the work done and on the interpersonal dynamics which characterized the path towards the delivered product at the end of Sprint. The retrospectives, held before starting the new Sprint, were facilitated in a lightweight way (e.g. using straightforward activities like Mad-Sad-Glad) to allow the kids to point out more easily the key items to reflect upon. Usually each retrospective had an individual reflection time first and then a team sharing to give everyone equal air time and avoid stronger characters to take the monopoly of the conversation. The highest voted improvement item by the team triggered a team commitment to one or more improvement actions to execute in the coming Sprint. For instance, in the first Sprint, one of the teams had wrongly interpreted the information on the atlas map and included inside Veneto (Venice region) a big lake where you are supposed to find Dolomites! During the retrospective the team had the chance to reflect that, possibly, studying the region first, before representing it graphically on the construction paper, would be a better option (before the end of the school year they also managed to fix the mistake effectively!). It was extremely interesting for us to notice how, thanks to regular retrospectives, each team developed a self-consciousness of being one team with one common goal. At the beginning, some students, usually poorly disposed to stay focused and participate actively to the school activities, tended to isolate during the daily working time or to group with classmates from other teams, who had the same low commitment or the same poor inclination to teamwork. These aspects started to emerge during the Sprint retrospective and some kids, publicly confronted by their teammates, first reacted with denial and even burst into tears, accusing the others of not involving them. Every team has to go through a Storming phase! However these heated debates brought their fruits. 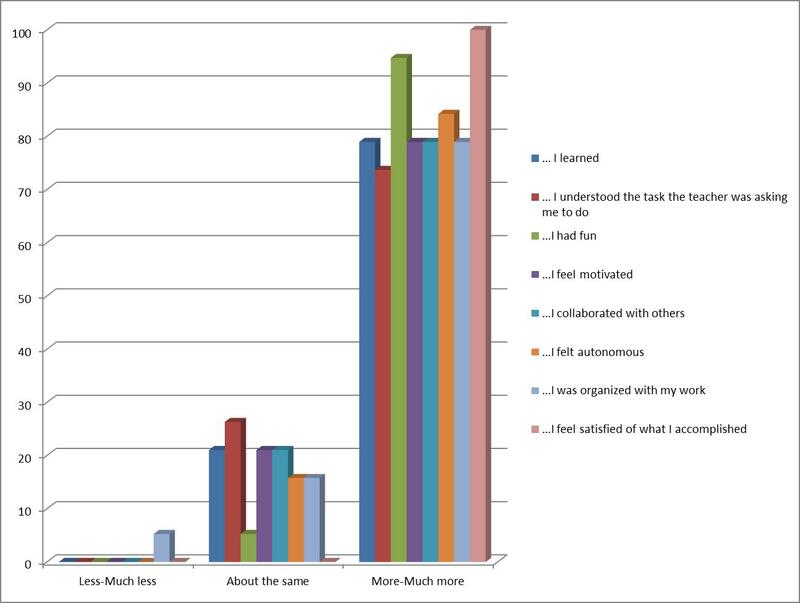 The students, who did not show commitment, realized that their disengagement wasn’t going unnoticed; at the same time the “hard-working part” of the team acquired a higher sense of responsibility in engaging their teammates, who probably wanted (and needed) to be a bit more stimulated and supported in their learning journey. In some cases, this sense of responsibility took some particularly capable and mature student to play a mentoring role towards the kids who showed some learning difficulties, naturally nudged by the framework to practice “cooperative learning” and “learning by doing”. In a wonderful talk to a group of young students, Simon Sinek says: “Learn by practicing helping each other. It will be the most valuable thing you ever learned in your entire life”. And this was exactly what our kids were experimenting. The fact that no one was a formally recognized leader, nor could ever be, put a stop to some usually strong leaderships, who used to dominate the class. This boosted instead who more often preferred to follow others. Interpersonal dynamics enjoyed great benefits during the journey, especially due to the need for the team members to necessarily achieve some form of group consensus, in order to move forward and progress in the work. As the northern regions were inserted into the map and started to connect with each other, a discrepancy in the quality of the work among the different teams and few integration issues became obvious. For instance, the coloring looked in-homogeneous, while rivers crossing over multiple regions flew incongruently. It was so visible, that the kids realized that they needed to collaborate across teams, especially to define the borders between different regions and to agree on the execution of common areas to multiple regions. They also co-created a common Definition of Done. 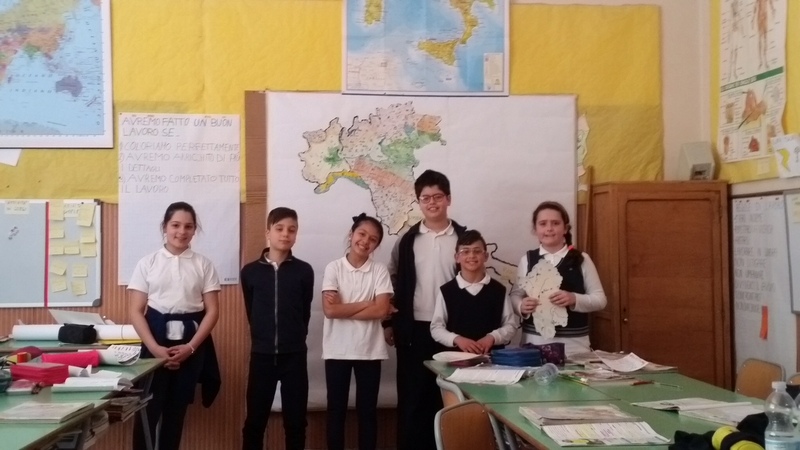 At the end of the school year, the last region to complete was Campania, their home region. In that specific case the backlog item was divided into smaller chunks (five provinces) to allow all teams to collaborate, but still keep their own Sprint backlog. Both half-way and at the end of the year, all parents were invited to the Sprint Review to experience first-hand what their children were doing and learning. The reactions were enthusiast to say the least: they said that their kids were telling them what they did at school, but seeing them in action in a fully autonomous and self-organized way was a source of great satisfaction for them. In both cases the day ended with a celebration in the classroom, where the whole group could taste delicious food and cakes which the kids and their parents had prepared at home and brought to school. 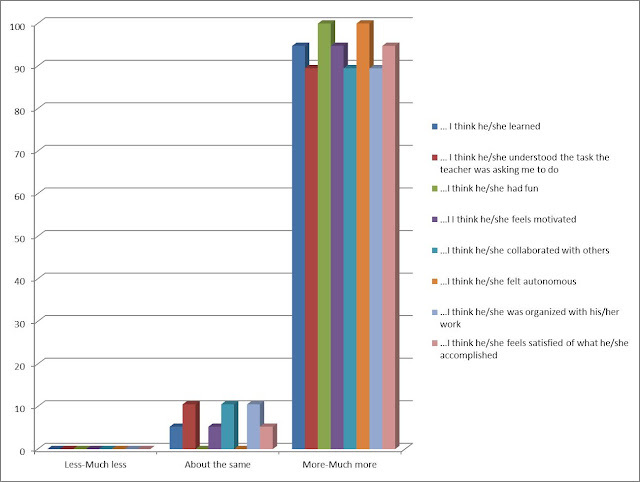 We analyzed the results of the experiment through collection of both subjective and objective data. First we asked kids and their parents to fill in a multiple choices questionnaire to evaluate the experience compared to a similar course they had to study in the previous years. 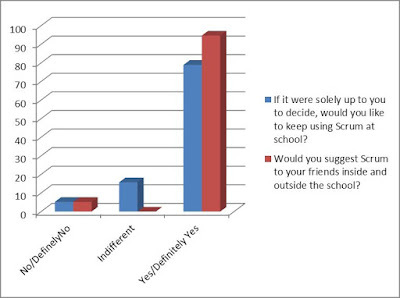 The idea was to look at what happened from the perspective of the students and the perception of their parents. The questionnaire for the parents contained the same questions: we just replaced “I” with “My child”. More than 84% of the kids' answers were positive, including all the answers reporting "More" or "Much more", "Yes" or "Definitely yes" in the definition of "positive". The rest were basically neutral answers with less than 2% of the answers being negative. The parents' evaluation was even more positive: 95% of the answers were positive and absolutely none was negative. In particular below are charts showing the percentage of the answers for the different statements in the questionnaire for the students and their parents. The objective evaluation includes the proficiency the different kids achieved in a variety of skills and disciplines analyzed from the teacher perspectives. The data emerged at the end of the project are reported in the table below and are classified in different areas, to make them easier to read. Before the project, the class group had already a good level of social and relational skills, but there was a certain tendency to privilege some friendly relationships compared to others, which were kind of less “desired”. The need to involve and get consensus from others, with no chance to “impose” any decision, has clearly sharpened the relational skills of every student, both those who are more naturally inclined to lead and those who are more kind of “followers”. The former ones had to learn how to articulate their ideas more effectively, the latter ones got finally the chance to dissent and propose, although still with hesitance, alternative suggestions. And everything happened in a more and more collaborative and fun environment as the time went by. The framework gave structure and a feeling of rhythm and cadence to the work. This made the rules of the game more visible, more effective and thus easier to follow, with a direct consequence on the kids’ ability to respect ground rules about living at school and outside the school. The interest of the kids into all activities and consequently into the studied discipline was very high throughout the whole experiment. This gets even more relevance if analyzed in comparison with the same discipline studied in the previous school year. The clarity of the expected outcome and the enablers in the framework gave the possibility to constantly reflect on strengths and improvement areas and directly act on them both on individual and team level. As a consequence the level of ownership was always pretty high. Capturing attention and stimulating motivation is usually pretty hard with a subject like geography at a primary school. Differently from last year and from former professional experiences the teacher had with grade 5 students, there was no need to motivate kids to learn this time. They just showed so much drive towards their goal and how to reach it in the best possible way, that no additional motivator was necessary. The participation to the class activities was very high. The major educational success of this activity was determined by the high level of engagement, especially of those who were more prone to lose focus and used to participate less. The proposed project looked just like a technical and graphical activity, but in reality required an accurate study of the discipline, which the kids accomplished without even realizing it. The strive to achieve the final result pushed them to research as much information as possible, in order to deliver a quality product (the map) which was easy to understand also for the classmates, who had not studied the specific region. The level of commitment was simply a result of motivation and engagement, so obviously the results were very positive. The students who were used to achieve outstanding results, simply excelled in the project. But most important, the kids who were used to struggle to achieve a sufficient grade, reached educational results far above their average, also thanks to the support and help from their teammates. One of the biggest outcomes of this project was the improvement in terms of ability to plan the work and time management: at the end of the year all the students reached an outstanding level of autonomy and self-organization. Even the kids, who had more troubles in finding an effective time management approach, had the chance to catch up thanks to the intrinsic focus and the teamwork. The class group which experimented this project had already pretty high average level of proficiency and grades. However the multiple elements, emerging from the project, contributed to determine a generally much more positive grade compared to the results achieved by the same students in previous school years. It is interesting to highlight that the results achieved have been even more positive for the students who had already outstanding grades. Those who had good grades accomplished remarkable improvements, with a greater awareness of their own abilities. Those who barely reached a sufficient grade had numerically better grades, but the fundamental outcome of this experiment was an actual acquisition of new competences from all kids. Those competences include the ones that in the European Commission White paper “Teaching andlearning: Towards the Learning Society” are denoted as: the Know-how (skills), the Know-how-to-be (attitudes), the Knowledge. These are the goals to purse at school: the students must acquire Knowledge (Rome is the capital city of Italy; Monte Bianco is on the Alps, etc. ), but they have to acquire also, and much more than the mere knowledge, the Know-How (logical skills, intuitive skills, linguistic skills, etc.) and the right Know-how-to-be. Actually the most important task of the school nowadays should be to help kids learn how to learn, so that they can keep learning for the rest of their life and the applied methodology seemed to support very much this direction. The experiment tried to give an answer to following questions. 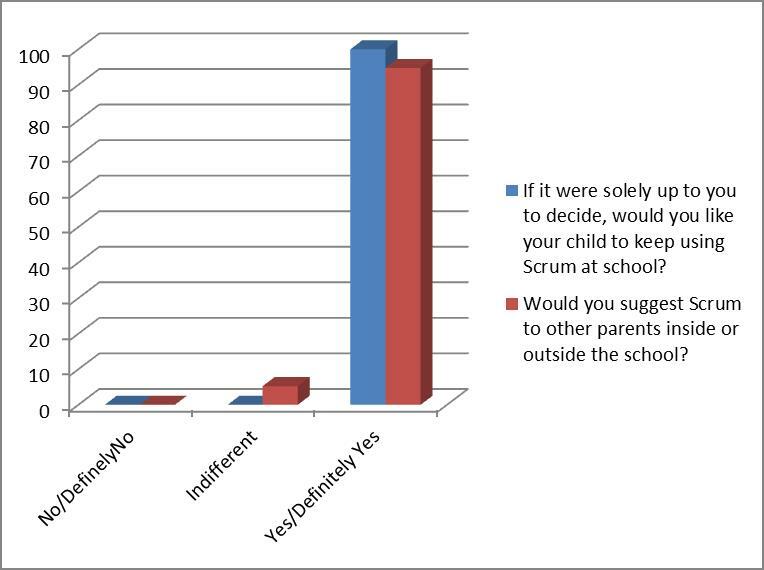 Can Scrum used in education support to create a learning experience for kids which would encompass the following? Training skills which are crucial in the 21st century and the school is traditionally not that good at teaching, e.g. Can this work in the context of a primary school in the South Italy? 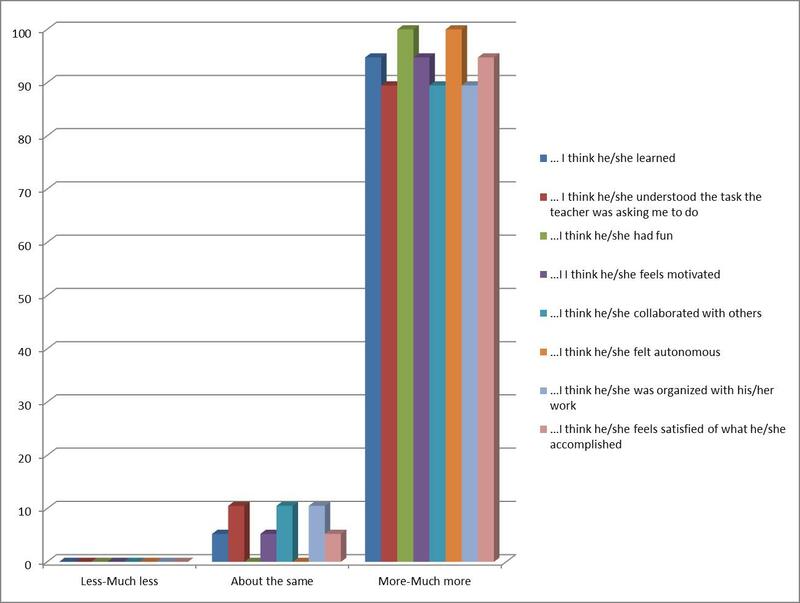 The empirical evidence of what happened during the experience (including the observation of the behaviors naturally nudged by the adoption of the Scrum framework) as well the collected results, encourage a positive answer to these questions and validate the assumption that Scrum is a powerful change engine in many different contexts. Scrum is founded on empirical process control theory, which asserts that knowledge comes from experience and making decisions based on what is known. Scrum employs an iterative, incremental approach to optimize chances of success when addressing a complex problem, a problem where solution is unknown or multi-faceted, including learning something new. Empirical process control has three pillars: transparency, inspection, and adaptation. When you manage to create an environment where the values of commitment, courage, focus, openness and respect are embodied and lived by the Team, the Scrum pillars of transparency, inspection, and adaptation come to life and build trust for everyone. Then people, whether kids or adults, are capable to learn and explore as they work with Scrum. On top of that, the students could engage with their classmates and their teacher in a much more human and profound way and live an experience they will probably remember forever and tell to their grandchildren. And that’s what made this experience mostly rewarding for my brother and me! great experiment and very interesting reading !